In the Depression year of 1931, on the golf links at Krewe Island off Savannah's windswept shore, two legends of the game—Bobby Jones and Walter Hagen—meet for a mesmerizing thirty-six-hole showdown. Another golfer will also compete—a troubled local war hero, once a champion, who comes with his mentor and caddie, the mysterious Bagger Vance. It is Vance, sage and charismatic, who will ultimately guide the match, for he holds the secret of the Authentic Swing. And he alone can show his protege the way back to glory. 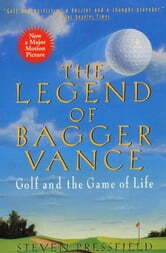 Written in the spirit of Golf in the Kingdom and The Natural, The Legend of Bagger Vance reveals the true nature of the game in a story that is unforgettable.